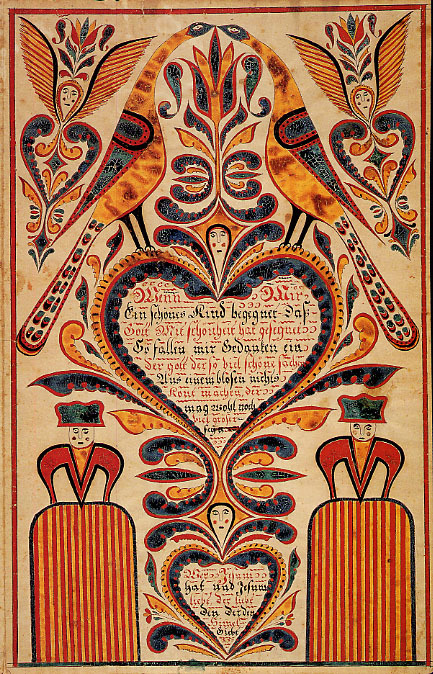 Fraktur is a folk art form practiced by Pennsylvania Germans principally from the mid-eighteenth to the mid-nineteenth centuries. The name derives from that of a distinctive German script marked by “fractured” pen strokes and the form has clear roots in European folk culture. 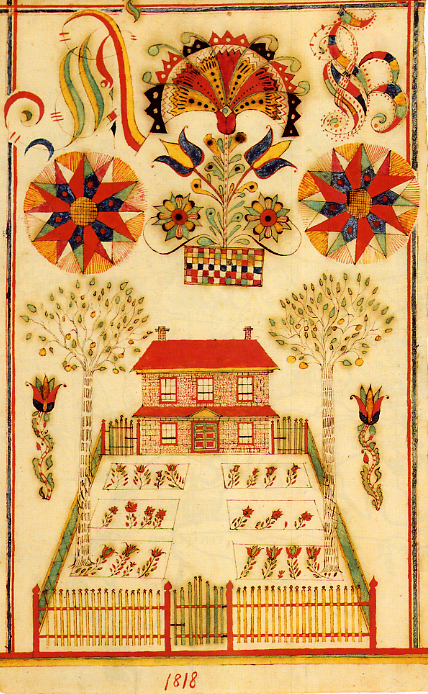 Fraktur blossomed into a uniquely rich, colorful and iconographic form of expression in the United States, tied to rites of social life. This site is meant to encourage and heighten your appreciation of this art form. In addition to essays and descriptive material, it features a bibliography of published resources on fraktur. I offer FrakturWeb to you with two hopes: that you will be encouraged to explore this fascinating subject yourself and that those of you with experience in the field will contribute comments and corrections. Joel Clemmer, 2154 Fairmount Avenue, Saint Paul, MN 55105. The site is arranged into five sections, to which you can navigate via the drop down menus above. To view the illustrations up close, hover your mouse over them and click. I hope you enjoy FrakturWeb!